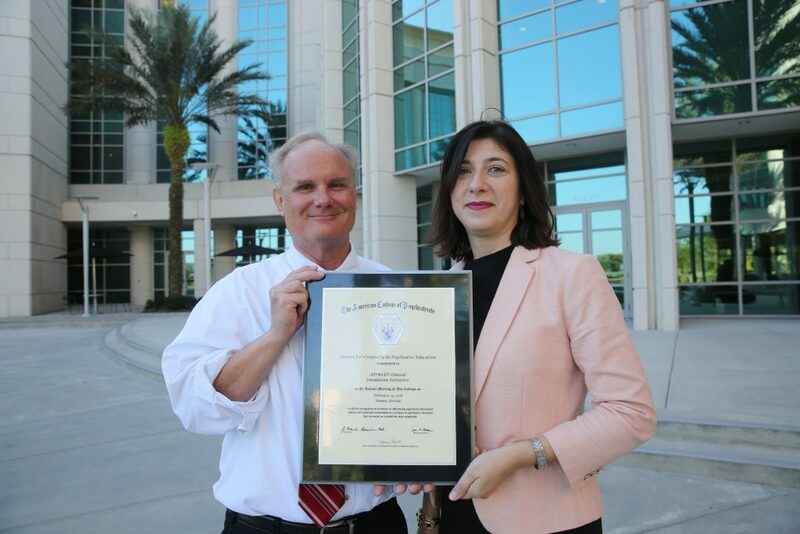 UCF’s medical school opioid education has received another national honor, this time from the American College of Psychiatrists. The Clinical Simulation Initiative (CSI), co-founded by UCF psychiatry professor Dr. Martin Klapheke, recently received a national award for Creativity in Psychiatric Education which recognizes noteworthy teaching innovations in the field. That module features a standardized patient (an actor who plays the role of a patient) who becomes addicted to opioids after injuring his back at work. A family member, concerned about the patient’s increasing need for pain medication, brings him to the doctor for care. Medical students are challenged to devise a treatment plan for someone in pain, develop alternative or low-risk strategies to treat pain, identify signs of addiction and develop plans for how to respond to a possible opioid overdose. As a family medicine specialist, Dr. Pasarica shows students the role of the primary care physician in preventing opioid addiction. Dr. Klapheke demonstrates the role of a psychiatrist in helping the patient and his or her family deal with possible addiction and overdoses. Four out of five heroin addicts started with pain medications prescribed by their doctors, and in Florida, at least five people die from an opioid overdose each day. Based on those statistics, the College of Medicine revised its curriculum to teach students the dangers of prescribing opioids for pain. At UCF, opioid education is included in all four years of medical school. Students learn the dangers of prescribing opioids for conditions like chronic pain and arthritis and how to reduce the risk of addiction. Students also learn how to resuscitate someone who has overdosed and to teach family members of addicted patients how to administer antidotes. They also learn about alternatives to painkillers such as biofeedback and exercise therapy. Dr. Klapheke said he is honored that school’s efforts at innovation in medical education is being recognized. He hopes to see more collaborative, interdisciplinary approaches to medical education to help combat the opioid crisis.